The prognosis in cases of right atrial isomerism with obstructed total anomalous pulmonary venous connection remains unsatisfactory. In particular, mortality following surgical repair of obstructed total anomalous pulmonary venous connection in the neonatal period is high. This case report describes a patient who underwent primary drug-eluting stent implantation for treatment of obstructed total anomalous pulmonary venous connection associated with right atrial isomerism. The stent was placed on the day of birth, and a definitive Fontan procedure was performed at 16 months of age. We also discuss the stent specimen, which had been implanted in the vertical vein for a total of 5 months. To our knowledge, this case report is the first to describe a drug-eluting stent specimen implanted in a draining vein associated with right atrial isomerism. The surgical outcomes of patients with functional single ventricles have improved during the last several decades. However, the prognosis in cases of right atrial isomerism (RAI) remains unsatisfactory.1) Draining vein stenosis in the context of total anomalous pulmonary venous connection (TAPVC) is a substantial risk factor for a poor outcome; however, several other factors also likely contribute to an unfavorable prognosis, such as ventricular dysfunction, significant arrhythmias, significant common atrioventricular valvular regurgitation, obstruction of pulmonary outflow, and sepsis associated with splenic dysfunction.1) A recent multicenter study demonstrated that TAPVC repair in patients with heterotaxy and a functional single ventricle has a high mortality rate of 43%.2) Another study showed that the mortality rate following surgical repair of obstructed TAPVC in the neonatal period is high.3) Stent implantation for obstructed TAPVC can forestall the need for surgery in the neonatal period. However, the frequency of in-stent stenosis is high, especially when a bare metal stents (BMS) is used.4) In the present case, we implanted a drug-eluting stent (DES) to bridge a vertical vein (VV) stenosis in a patient with supracardiac TAPVC associated with RAI on the day of birth. We performed a successful Fontan procedure when the patient was 16 months old. We also discuss the stent specimen, which had been implanted in the VV for a total of 5 months. A prenatally diagnosed male infant was delivered by scheduled cesarean section at 37 weeks of gestation. His birth weight was 2.6 kg. His respiration rate ranged from 60 to 70 breaths/min, and his oxygen saturation ranged from 50% to 60%. He was immediately intubated. Echocardiography revealed the same findings obtained in the fetal diagnosis: RAI, single right ventricle, single atrium, common atrioventricular valve, right aortic arch, patent ductus arteriosus, bilateral superior vena cava (SVC), and supracardiac TAPVC draining into the right-sided SVC via a severely obstructed VV. 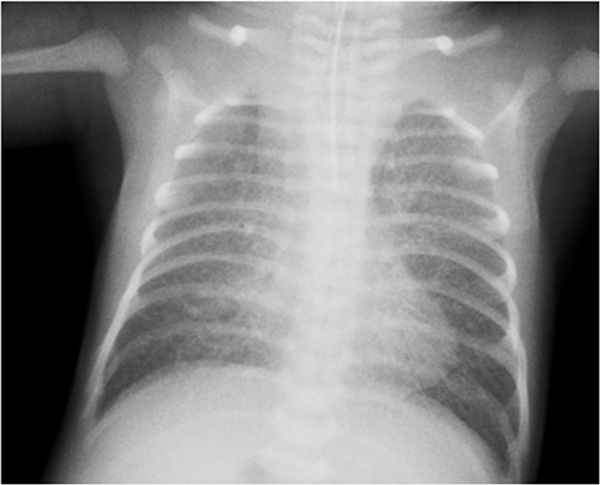 A chest radiograph revealed a small cardiac silhouette (cardiothoracic ratio of 47%) and pulmonary congestion (Fig. 1). We decided to place a palliative DES in the stenotic VV as planned from the fetal period. Three hours after birth, the patient was placed under general anesthesia. First, we introduced a 5-Fr short sheath into the right femoral vein. Using a 0.018-inch Radifocus guide wire and a 4-Fr Judkins coronary right catheter, we delivered a 2.3-Fr Progreat microcatheter to the common pulmonary venous chamber (CC). The mean CC pressure was 21 mmHg. An angiogram revealed severe stenosis of the VV (Fig. 2a). Next, we replaced the short sheath with a 5-Fr Cook long sheath and advanced it to the orifice of the VV draining into the right SVC. Using a 0.018-inch Radifocus guide wire, a 2.3-Fr Progreat microcatheter, and a 4-Fr Judkins coronary right catheter, we placed the distal side of the 5-Fr Cook long sheath across the stenosis. Using the 5-Fr Cook long sheath and a 0.014-inch Asahi Grand Slam wire, we implanted a DES (Resolute Integrity™ 4.0×9.0 mm) (Fig. 2b). The patient’s oxygen saturation consequently improved from 75% to 85% at a 0.21 fraction of inspired oxygen. Fig. 2 Angiogram displaying anteroposterior views of the obstructed vertical vein (a) prior to and (b) after stent implantation. (c) Patent vertical vein 4 months after stent implantation. Contrast medium injected into the right superior vena cava flowed into the CC via the vertical vein (arrow). The patient’s pulmonary blood flow increased daily, likely because of spontaneous reduction of pulmonary vascular resistance. At 4 days of age, we performed pulmonary artery (PA) banding (circumference diameter, 17 mm) and ductal artery ligation. We administered aspirin, warfarin, and heparin to maintain stent patency. The patient grew steadily without apparent symptoms of pulmonary venous obstruction. At 33 days of age, we performed a diagnostic catheter examination. The pressure gradient across the stent was 0 mmHg. Patency of the stent was confirmed by an angiogram. The mean PA pressure was 26 mmHg, which exceeded the level at which the patient would have been a candidate for the Glenn procedure. At 2 months of age, we performed TAPVC repair and tightening of PA banding (circumference diameter, 15 mm) instead of the Glenn procedure. The stent was left in place because removal would have been complicated. We discontinued antiplatelet and anticoagulation therapy. At 4 months of age, we performed another diagnostic catheter examination. The mean PA pressure was 15 mmHg. The pulmonary blood flow/systemic blood flow ratio and pulmonary resistance index were 2.3 and 2.3 units×m2, respectively. These values were suitable to proceed with planning for the Glenn procedure. An angiogram revealed that the stent remained widely patent (Fig. 2c). The diameter of the stent was 3.4 mm on the angiogram. Blood flow was detected from the SVC to the CC. The SVC pressure was 5 mmHg and the right atrial pressure was 3 mmHg, suggesting that the pressure gradient across the stent was 2 mmHg. At 5 months of age, we performed a bilateral bidirectional Glenn procedure and removed the stent. We discharged the patient 9 days following the procedure. Fig. 3 shows the specimen of the stent. The stented lumen was widely patent without stenosis or thrombosis. The configuration of the stent was fully circular. The neointimal thickness was approximately 500 µm. The minimum inner diameter of the stent was 3.8×1.9 mm. The stent strut was completely covered with the neointima. Chronic inflammatory cells, including lymphocytes, histiocytes, and neovessels, were observed around the struts. (a) The stented lumen was widely patent without stenosis or thrombosis. The configuration of the stent was fully circular. The neointimal thickness was approximately 500 µm. The minimum inner diameter of the stent was 3.8×1.9 mm. The stent strut was completely covered by neointima. (b) Chronic inflammatory cells including (a) lymphocytes, (b) histiocytes, and (c) neovessels were observed around the struts. At 15 months of age, we performed embolization of the aortopulmonary collateral arteries. We embolized five vessels using an Amplatzer vascular plug 4 and Orbit Galaxy detachable coils. Two weeks later, we performed another catheter examination. The mean PA pressure was 11 mmHg. The pulmonary blood flow/systemic blood flow ratio and the pulmonary resistance index were 1.2 and 0.94 units×m2, respectively. The right ventricular ejection fraction was 56%. Cardiac ventriculography revealed mild atrioventricular valve regurgitation. These values suggested that the patient was now a good candidate for the Fontan procedure. We performed the procedure when the patient was 16 months old using a 16-mm Gore-Tex extracardiac graft. We extubated him 7 hours after surgery and discharged him to home on postoperative day 10. The patient developed no adverse effects of zotarolimus, which was eluted from the Resolute Integrity™, such as cytopenia or renal dysfunction. Neonatal surgical outcomes are poor for repair of obstructed TAPVC associated with RAI.3) Recent evidence suggests that stenting of obstructed drainage veins may improve outcomes by forestalling surgery during the neonatal period.3) Unfortunately, in-stent stenosis occurs frequently, especially when a BMS is used.4) Considering the problem of restenosis of the pulmonary veins, less in-stent stenosis may occur in stents with a diameter of ≥7 mm.5) However, evidence regarding in-stent stenosis in the draining vein is lacking. Kitano et al.6) showed good outcomes in such cases by repeated redilation for in-stent stenosis. Some reports have described implantation of a DES for obstructed TAPVC with RAI.7) However, those reports did not mention whether the patients eventually underwent successful Fontan procedures. A DES is designed for adult ischemic heart disease. Restenosis rates are lower than those associated with a BMS.8) The Resolute Integrity™ elutes zotarolimus, a synthetic analog of rapamycin that is known to suppress lymphocyte-mediated inflammation and neointimal growth. The BioLinx polymer incorporated in the DES improves biocompatibility and extends drug elution for as long as 180 days, effectively reducing neointimal proliferation9, 10). The stent also features a new flexible platform constructed from a cobalt-chromium alloy that increases deliverability and conformability.11) These features allowed us to more easily deliver the stent to a draining vein with a complex shape. Clinicians should closely observe patients for the development of systemic adverse effects of eluted drugs. Although some past studies showed no adverse events and a rapid decrease in the serum drug level after implantation of a DES, these studies did not evaluate zotarolimus-eluting stents12, 13). Our patient developed no adverse effects, such as cytopenia or renal dysfunction; however, we did not monitor the serum drug level. Fig. 3 shows a stained section of the stent that had been implanted in the VV 5 months prior. The lumen was widely patent without evidence of stenosis or thrombosis. The configuration was fully circular, with a neointimal thickness of approximately 500 µm. We observed inflammatory cells surrounding the struts, but not occupying the entire circumference. According to a study of porcine coronary arteries, this form of inflammation would be grade 2 (on a scale of 0–3).14) Whether this scoring system can be generalized to human veins is unknown. Because there is no similar pathological report of BMS implanted in a drainage vein, we cannot compare the pathological features between a DES and BMS. The main disadvantage of a DES is its small diameter. The diameter of the Resolute Integrity™ is 4 mm. This size may become insufficient to receive pulmonary venous flow as the patient grows. 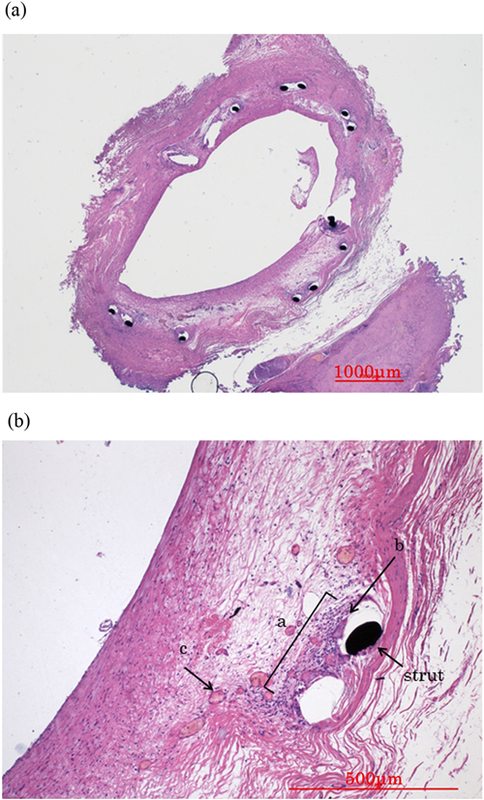 Nakano et al.15) successfully overdilated a Resolute Integrity™ with a 7-mm balloon in vitro; however, residual local stenosis remained after attempting redilation with a 6-mm balloon in vivo. Although choosing a DES does not provide a long asymptomatic period until the following surgery, we believe that this stent size is adequate for use during the neonatal period. For critically ill neonates with RAI and obstructed TAPVC, stenting of the stenotic draining vein of TAPVC with a DES is an attractive option. We thank Dr. Gaku Nakazawa for preparing the stent specimens and for providing helpful insights. We also thank Robert Lindeman, MD, PhD and Angela Morben, DVM, ELS from Edanz Group (www.edanzediting.com/ac) for editing a draft of this manuscript.